In the sport of bodybuilding they don’t come much bigger, physically and metaphorically, than Jay Cutler. The four-time Mr Olympia is one of the true legends of the game, racking up titles wins across his illustrious career – and taking part in one of bodybuilding’s great rivalries alongside Ronnie Coleman. Thoughtful and measured in his approach to training, Cutler is in phenomenal shape – despite retiring from stage competition five years ago. Sport360 had the incredible opportunity to train alongside him in the lead up to the Dubai Muscle Show – which takes place on December 7/8 at the World Trade Centre. Take a look at the session in the video above, as Jay reveals some of his training tips, principals and more on his life outside competing. More than 250 yogis covered Caesars Palace Bluewater, gracefully contorted in fantastic asanas for a seaside sunset Yoga session led by Melissa Ghattas on Saturday. 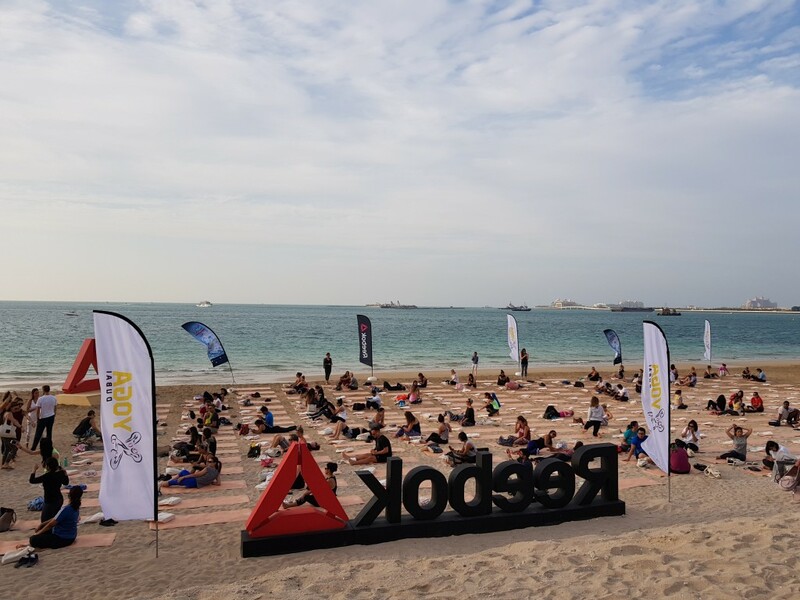 The XYoga Dubai’s Sundown Breath, powered by Reebok was part of the finale for the second edition of the Dubai Fitness Challenge, which brought together people from all over the UAE for an evening of fun-filled yoga. The event was only open for people who were 18 years of age or over and provided a much-needed break from the hustle and bustle of fast-paced city life. For many, such as Manik Talwar, the event surpassed all his expectations, not only did it turn out to be a wonderful experience, but was a great way to end the 30×30 fitness challenge. “It was an evening well-spent with friends and a great opportunity for yogis from all walks of life to connect with like-minded people. I have never felt this calm and relaxed, this is definitely the best finale for the Dubai Fitness Challenge,” said the 25-year-old, whose involvement with Yoga is fairly recent. For others, the event was a very new experience and was not anything like they had ever tried before. 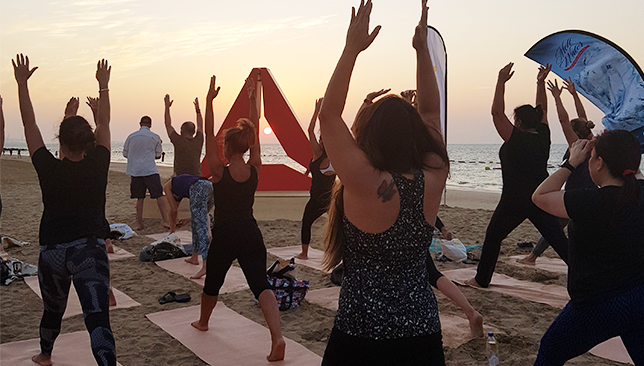 Claire Treanor, 45, has been in Dubai for a little over a decade, but the XYoga Dubai’s Sundown Breath was her first experience with beach yoga. “It is the first time I’m trying beach yoga and I must say, this has been a great experience. I loved the vibe and the energy of the session and Melissa (Ghattas) was absolute great,” she said. Another satisfied participant was Monica Agrawala, who had come to the session with her husband and is absolutely in love with the yoga scene in Dubai. “I have been practicing yoga on and off, but I really look forward to attending these kinds of yoga session. It’s just a great way to relax, unwind and meet new people. Honestly, the yoga scene in Dubai absolutely rocks,” the spirited 43-year-old said. 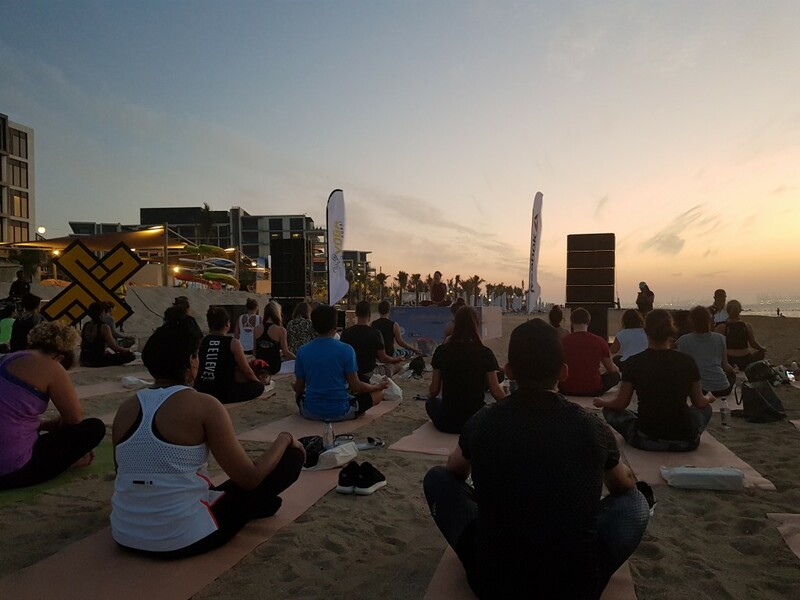 Melissa Ghattas, the lead instructor of the event, was immensely pleased with the turnout and feels with events like XYoga, the practice is definitely taking roots in the UAE, as everyone is now more aware of the benefits associated with it. “I am just amazed by the numbers and really grateful that so many people showed up for the session. The unity and togetherness of the Yoga community is definitely inspiring,” she said. Staff members (l-r) Lynn Horwell, Niall Statham, Adam Whitty and Katie James (seated). 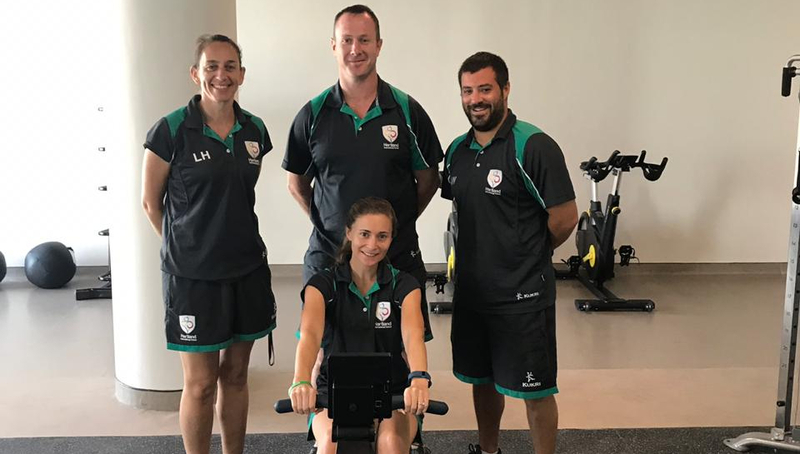 Hartland International School will be bringing their Dubai Fitness Challenge bid to a close with an ambitious rowing challenge on Wednesday, November 21. Over 30 staff and members of the Hartland community will take on the arduous task of rowing continuously for 24 hours. The tall order will come to a climax with a closing ceremony at 13:20 on Thursday, November 22. “We hope that by completing this challenge, we can demonstrate to the students that with resilience and determination, a group of ordinary people can come together to achieve something extraordinary,” said Niall Statham, head of PE at the school. Lynn Horwell and Katie James will be among the staff taking part, in addition to Statham and Whitty. The Dubai Fitness Challenge started in 2017 as a citywide initiative of His Highness Sheikh Hamdan bin Mohammed Al Maktoum, Crown Prince of Dubai and Chairman of the Executive Council for Dubai Government. The challenge encourages every resident and visitor to the city to exercise continuously for at least 30 minutes for 30 consecutive days, turning Dubai into the most active city in the world. Nearly one million people from government, corporate, schools, universities and the public joined in the movement in the initiative’s first year and committed to getting their daily #Dubai30X30. This year, the Dubai Fitness Challenge has returned to continue this commitment and to bring the fitness world to you. With an all-new Dubai Fitness app, an action-packed calendar of events and a host of free fitness activities all across the city, it’s all about igniting a movement.